This story is from the February 2004 issue of Motocross Action Magazine. It wasn’t long ago that Sylvester Stallone, Steven Seagal and Bruce Willis were action heroes. A decade ago, they dominated the box office receipts and garnered 20 mil a movie. But, the days of “Rambo III”, “Die Hard” and “Marked for Death” are long gone. The glory that was–was. Kawasaki knows how the ex-Hollywood hunks feel, because they too once dominated the charts. 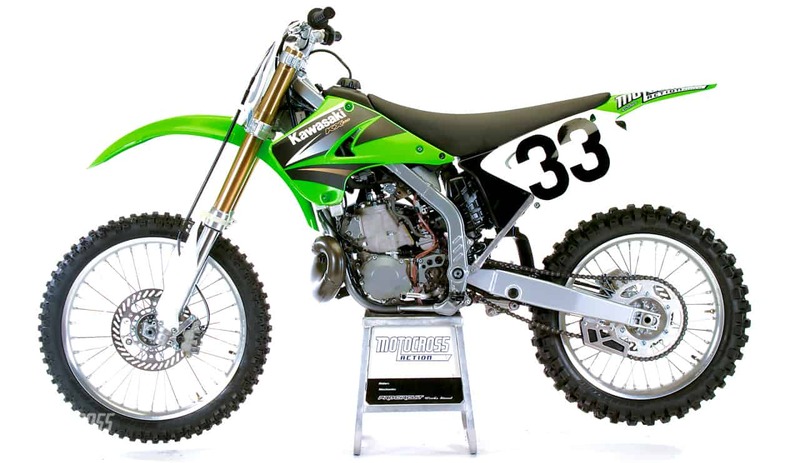 From 1997 to 1999, the KX250 was the Bike of the Year. It was a smash hit. It was on everyone’s A-list. It was the critics’ favorite. Unfortunately, over the last five years, the box office appeal of the green machine has waned. Can they get it back? Will the 2004 KX250 win an Oscar? Q: IS THE 2004 KX250 ENGINE FASTER THAN LAST YEAR? A: Yes. But let’s not get too misty about the 2004 KX250 being faster than the ’03 model. The ’03 KX250 wouldn’t crack 43 horsepower on the dyno. And while the ’04 KX does break the 43 pony barrier, that is no great feat–considering that everyone else is pushing 46. Q: IS IT FAST OR SLOW? 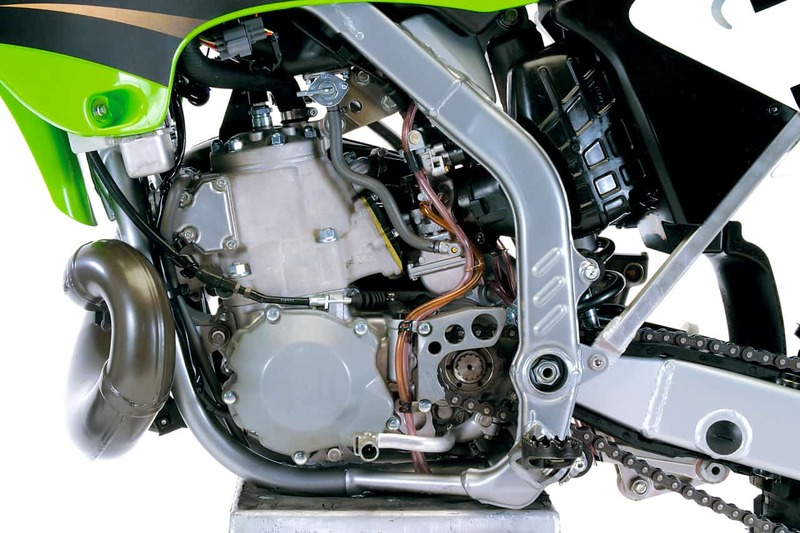 The 2004 Kawasaki KX250 engine is slow in comparison to its competition. Q: WHAT ABOUT THE KX250 GEARING? A: We recommend gearing it down one tooth to help bridge the gap from second to third (which seemed large because of the lack of effective over-rev). Q: HOW IS THE JETTING? A: Perfect. For MXA’s sea-level race tracks and summer temps, the 2004 KX250 required nothing more than an air screw adjustment. Q: HOW GOOD IS THE SHIFTING? A: Mediocre at best. The clutch has a draggy feel and the gearbox requires concentration to hit every gear perfectly. If you like to keep your bike upright, tuck to the inside of most turns and accelerate in a straight line, the KX250’s chassis is handmade for your riding style. Q: WHAT ABOUT THE 2004 KX250 SUSPENSION? A: Kawasaki’s Kayaba forks are on their third damping system in three years and, adding to the mix, the rear suspension has been totally redesigned (including the linkage, shock and valving). 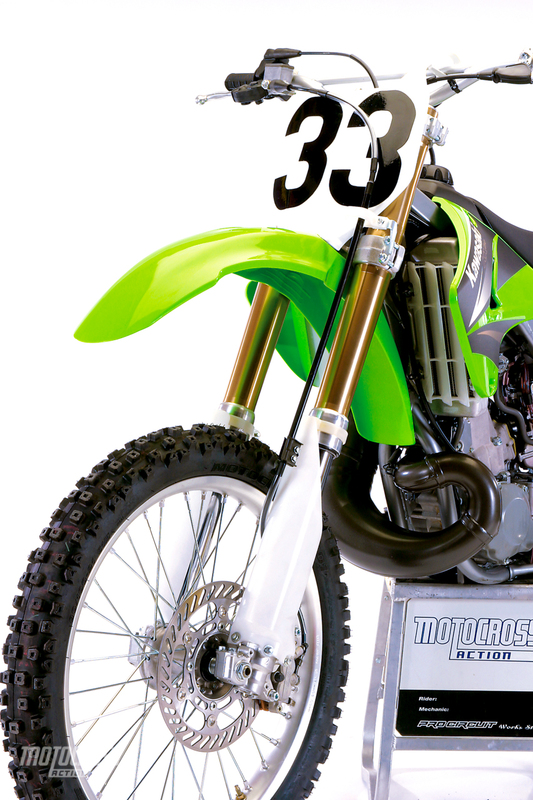 Forks: Last year, Kawasaki jumped off of the bladder fork wagon and went with bumper forks. This year they retreated from bumper forks to something they call “semi-sealed cartridge forks.” We liked this fork, but it was a little on the soft side, a problem that was made worse by Kawasaki’s front ride height. For some reason Kawasaki’s engineers want the forks to slide up into the clamps. This is a no-no. Slide them down until 5mm sticks out above the top of the clamps. Otherwise, it is stinkbug city. We ran the compression on 12 and rebound on 10. Shock: In an effort to regain lost ground in the suspension department, Kawasaki chucked their old shock linkage for a new Yamaha-style link. The new linkage changed the rising rate and shock deflection angle. Under some loads, the new KX suspension is a thing of beauty, but as a rule it doesn’t like square-edged bumps and requires considerable rebound damping. It has a dead feel and seems over-damped. 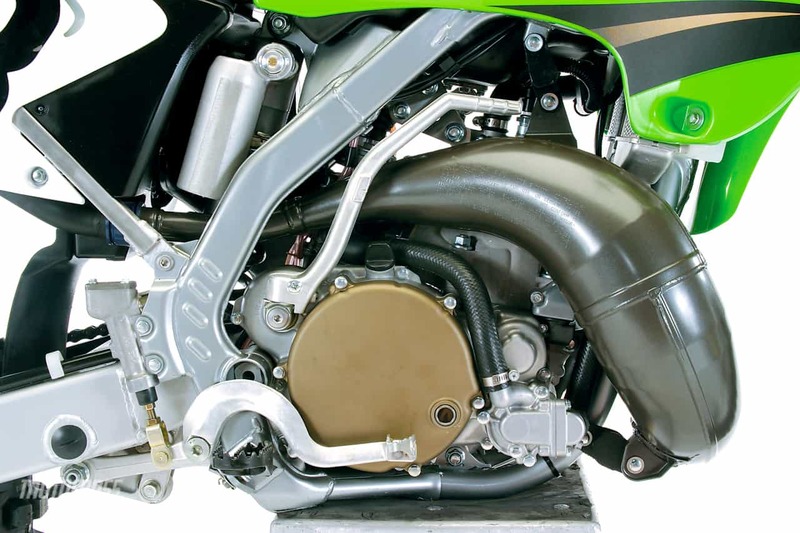 The lack of high-speed compression adjustment, which Kawasaki pioneered, forces the rider to depend more on race sag and low-speed compression than with comparable systems. We set the race sag at 100mm and the low-speed clicker on 12 out. Rebound varied from eight to ten clicks out. We liked this fork, but it was a little on the soft side, a problem that was made worse by Kawasaki’s front ride height. 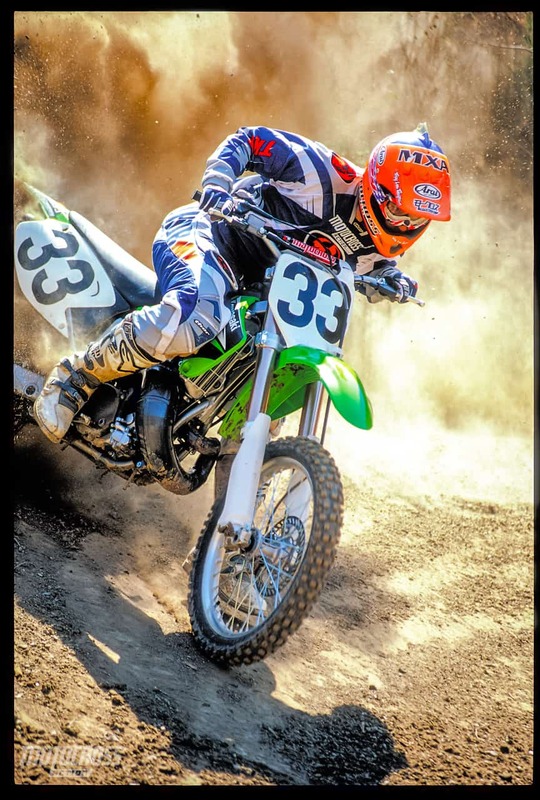 A: If you like to keep your bike upright, tuck to the inside of most turns and accelerate in a straight line, the KX250’s chassis is handmade for your riding style. It is neither as quick as the RM250 nor as stable as the YZ250. It has a middle-of-the-road style of handling that is best described as workmanlike. Kawasaki steepened the head angle for better turn-in last year, and the downside is considerable head shake (aggravated by the stinkbug stance). On tracks that feature heavy braking or high-speed sweepers, you should slide the forks as far down in the clamps as propriety allows. This will calm down the quiver. The ’03 KX250 wouldn’t crack 43 horsepower on the dyno. And while the ’04 KX does break the 43 pony barrier, that is no great feat–considering that everyone else is pushing 46. (1) Handlebars: Honda and KTM have upped the ante in the handlebar game. Kawasaki’s old-school steel bars look primitive by comparison. (2) Clutch adjuster: Everybody has on-the-fly clutch adjustment except Kawasaki. (3) Gas tank: We don’t like black gas tanks. Never will. You can’t tell if it’s full until the ground is wet. (4) Saddle: Very soft, although it has gripper material. (5) Clutch: It needs stiffer clutch springs to free up the mechanism. (6) Tires: Bridgestone’s M601/602 tires are very one-dimensional. They only work on hard dirt…very hard. (1) Jetting: It is spot-on. (2) Pipe: The gray pipe coating is the best thing any manufacturer ever put on a bike. It’s is durable, non-rusting and trick looking. (3) Bar clamps: The eccentric handlebar clamps can be rotated to give a rider two choices of bar positioning (we rotate them forward). (4) Number plates: Kudos to Kawasaki. Numbers actually fit on the number plates. What a concept! (5) Graphics: KTM and Kawasaki have the longest lasting stock graphics. 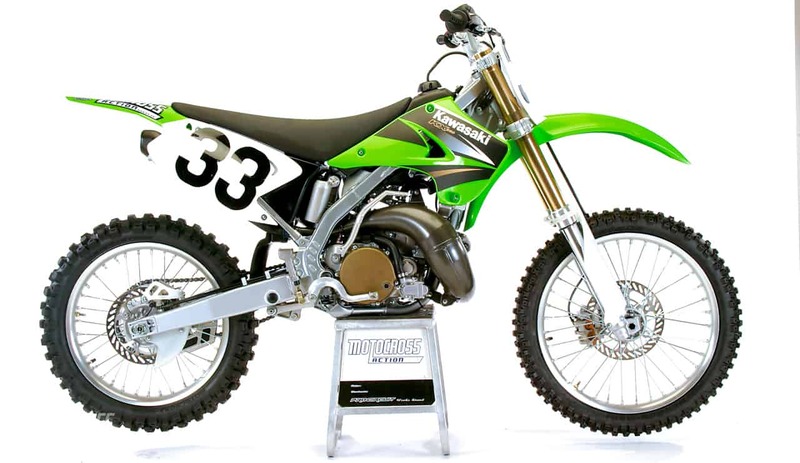 A: The KX250 needs about four more horses and 500 more rpm before it will be boffo at the box office. Every test rider felt that the KX250 had good traits, but delivered them in a discombobulated way. It is, in a word, unsyncopated.